I'll be starting of like yesterday with the wand. Once again a fibre bristle brush but unlike the Maybelline Great Lash, the wand is curved similarly to a spoon and the centre of the brush is the widest part. This brush tends to pick up a lot of the product because of this shape despite the cleaner tube at the top of the bottle. Sometimes it can be rather annoying for me and I have to clean off the wand on the tube, otherwise I can end up with so really over-clumped and messy lashes. For some reason I also forgot to take a picture of this brush, but you can refer to the above photo. Once again the problem with my eyes is these large brushes tend to be a bit too big. I have had other mascaras with regularly sized spoolies and they're still been able to give me everyday lengthen and volume. 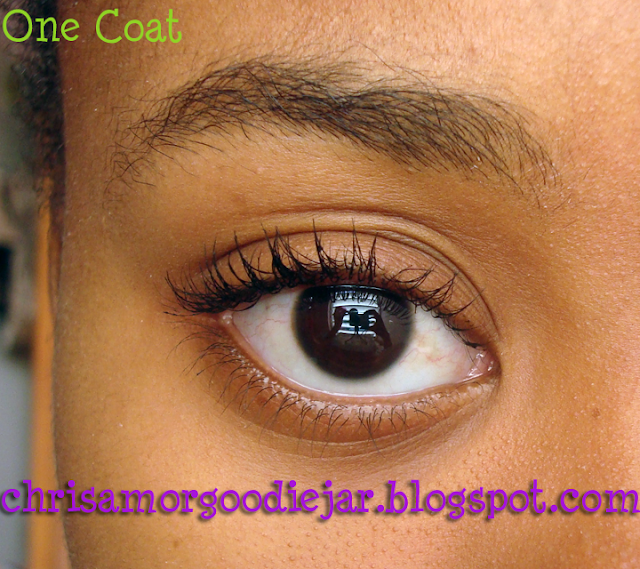 The formula on this mascara is thicker than the Great Lash for certain. I tried this first then I tried the Great Lash and was pleasantly surpised by it's lighter formula. The formula which the Falsies has tends to draw the length and volume faster than the Great Lash, making this mascara very easy to overdose on. The drying time I would say is about 7-10 seconds to completely dry before applying another coat, or you well end up with a mess. 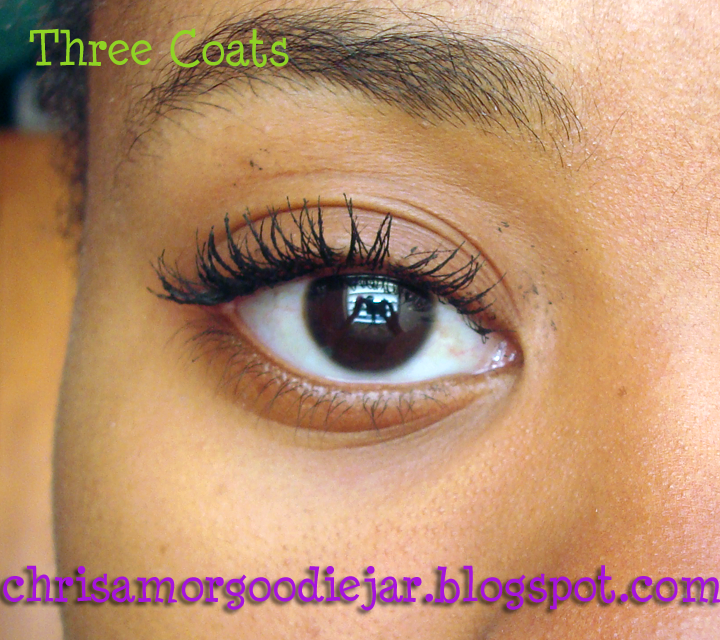 As you will see with this mascara, as you carefully apply more, the length and volume builds to extreme amounts, and I think it really does give that false lash effect. Oh yes, because the formula is so thick and weighs down my lashes a bit, I think this would be great paired with an eyelash curler. That way you can get the curl without as much manipulation as I have to go through. 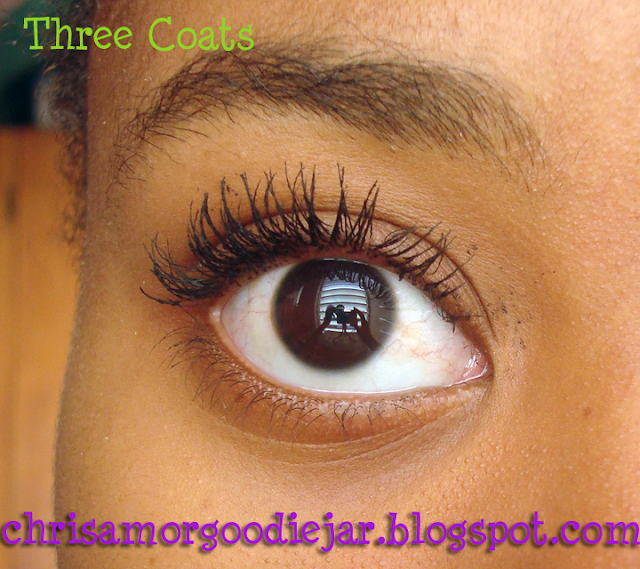 Three coats really had to be shown in two photos because the length was incredible! I have mentioned in the title that this is a waterproof mascara, so I took so pics to show you just how waterproof it is. I also spoke about using it on Grand Kadooment day in the video. Now let me tell you, on Grand Kadooment day rain poured in buckets! 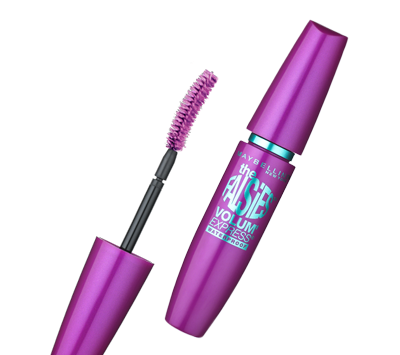 I had helped my sister out that morning and she had applied this mascara and another maybelline waterproof product, I think it was the Eyestudio waterproof eyeliner, around 8:00 a.m. She jumped with a band the entire day and when she came home she still had both on! Through rain, sweat and sun! I also wore this mascara from a bit later in the day when I watched the bands and it lasted all day! I was so very impressed. In the shots, I sprayed my eye with some water from a spray bottle then patted dry with a tissue, and the mascara barely budged. 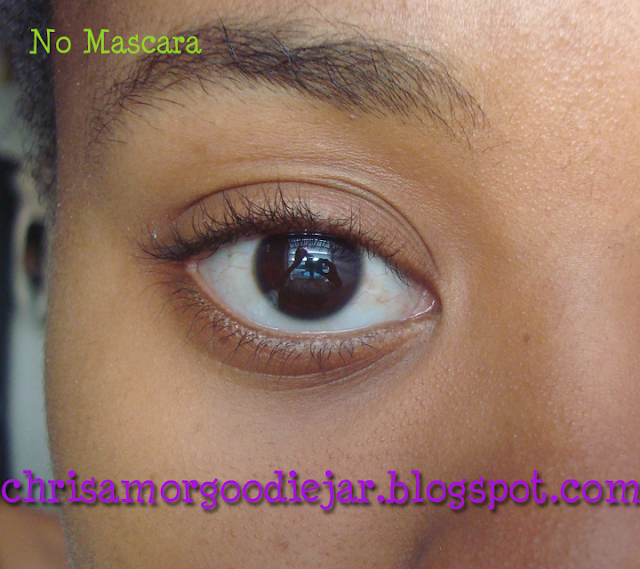 One time I took a nap in this mascara and then had leave home right afterwards, and this mascara was still nice. My lashes stayed wonderfully curled and they werent very mangled either. 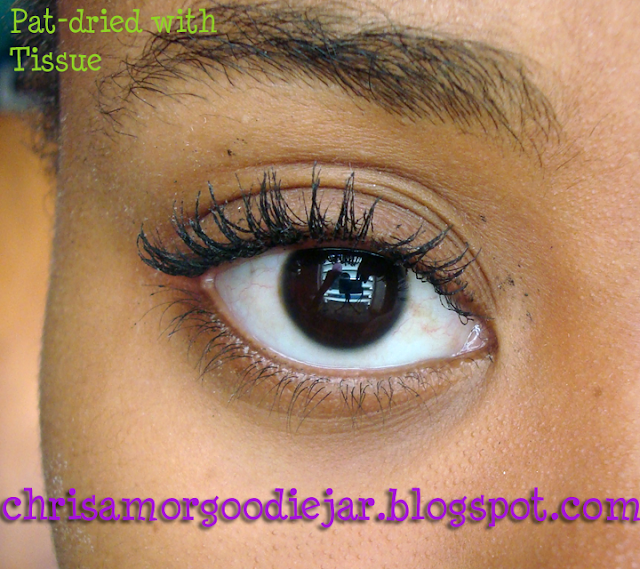 Now we know this mascara stays so amazingly great, I'll talk about removing it. 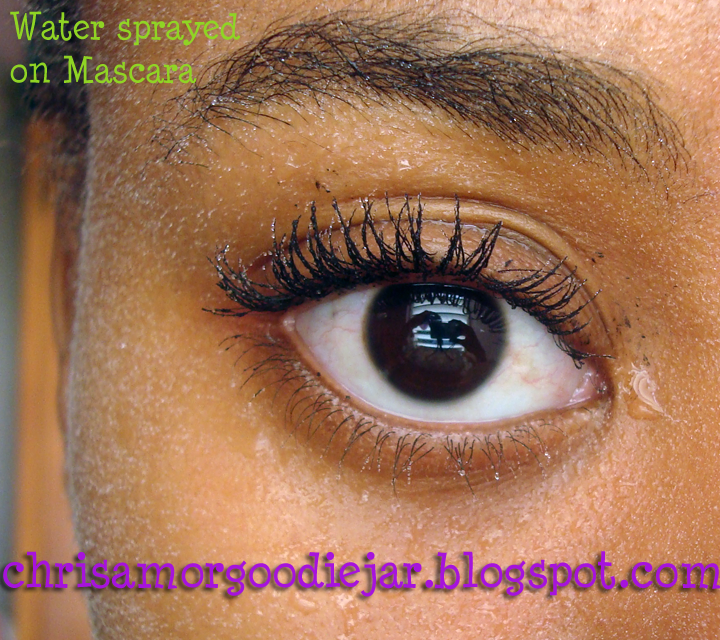 At first I hated to wear it because my previous eye make up remover could barely get it off. I'd soak a cotton pad and wait for like a minute to try to remove it, or I'd use olive oil. Sometimes I just got lazy and would wash my face and forget all about trying to remove it. But then I got a better eye make up remover, which I will be reviewing soon, and that got it off really nice and fast. The thing with waterproof mascara is, they have such great staying power that sometimes you can still be left with the residue, so I give it more time than normal mascara to be removed. After removing you might not always be able to tell there's a residue until later on when you feel your eyelashes. So you really have to make sure this mascara is all off before bed. This is also why I choose not wear waterproof mascara everyday because it can stay on so well it might end up drying out my lashes, plue I don't like how stiff it can make my lashes. According to all the buzz it's gotten, I think this mascara has been really pumped up in my mind, but I'm a bit disappointed in its cons. I actually like the Great Lash better, especially for everyday use. But if I'm going out somewhere nice, this is definitely my mascara of choice, also because I'm not so great with actual false lashes. Had this mascara been easier to remove, maybe I would have taken it out to wear much more often. Even so I never go for the full 3 coats, because I always fear taking it off haha. Also I would say using an eye lash curler would this would definitely make it easier to put on for me. It might just be that the waterproof formula has such a great staying power, that it's driving me to not like it that much, but I don't think I've seen the washable formula to try. 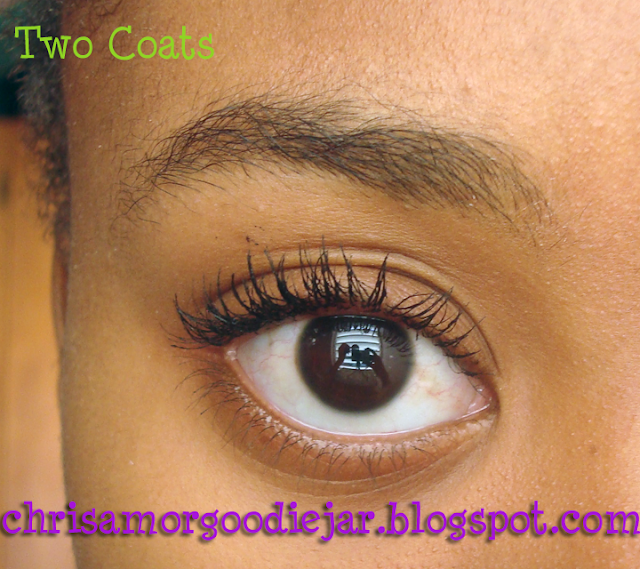 Either way, It's a great mascara for the false lash effect, awesome volume and length, gives great drama to the eyes, but it's a hassle to remove. Collins has the whole Maybelline and N.Y.C cosmetics line, it's quite fun to walk in there for me, hahaha.